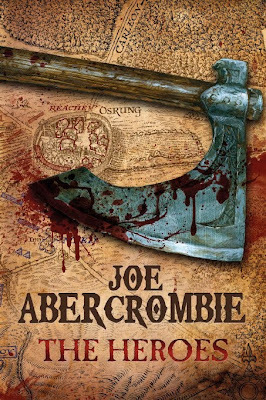 As promised, here is my latest Q&A with Joe Abercrombie! I teamed up with Ken (www.nethspace.blogspot.com) for this interview, and again it was a good collaboration, if I may say so myself! If you haven't read, Abercrombie's latest, The Heroes (Canada, USA, Europe), what are you waiting for!?! - Now that THE HEROES has been out for a while on both sides of the Atlantic, are you pleased with the way the book has been received thus far? I’m never pleased. I always want more. Like Sauron. - With THE HEROES making noise on the Sunday Times' bestseller list, do you think there will now be added pressure as far as your future novels are concerned? Readers will likely have higher expectations with each new work you publish. Do you ever think about that, or about the fact that publishers now expect you to move a certain amount of units every time something with your name on it hits the shelves? There’s always pressure. To produce a new book in good time. To make it better than the last from your own point of view, from that of the readers, the critics, the publisher. To sell more copies. But obviously one would much rather have the pressure of, “your last book did great, with this one we need to do even better,” than, “your last book was a disaster, if the next one doesn’t do better we’re going to drop you and you’ll have to get a real job.” You’re always conscious that only a small minority of published writers are able to earn their living out of it, and even if you’ve earned a place among those lucky few it doesn’t have to be forever. A couple of bad books and you’re out of favour again. It can be a tough way to make a living, in that sense. Not road-crew tough, but there’s always pressure. - Several maps in THE HEROES. What made you and Simon Spanton change your minds? The lack of maps had sort of become a running gag of sorts with you and your publisher. - Given the grittiness and violence which characterize your novels, were you surprised by the fact that quite a few of your fans found the tale of revenge that was BEST SERVED COLD off-putting? Is there a fine line between going for the gritty approach and overdoing it? I wouldn’t say I was surprised. The First Law was the thing I’d always wanted to write, and the ideas had been cooking slowly in my mind since childhood, in some cases. In a sense Best Served Cold was my difficult second novel – I had to come up with new ideas, new ways of writing on a schedule and that was pretty testing. There were two things I was particularly concerned about with that book. One was that it was much less self-consciously epic fantasy than the First Law had been, both in its plot and in the amount of fantastic elements. On the whole that didn’t really seem to bother people, though. The other was that I was pushing the “unsympatheticness” (if that’s a word) of the characters and the darkness and brutality of the action further even than I had with the First Law. Certainly I pushed it too far for some, and no doubt some readers found it hard to relate to the characters. Hard to find anyone to root for. And that’s not a good thing in a character-centred book, really, is it? So yes, there are fine lines between gritty and too gritty, violent and too violent, interestingly dark and utterly repulsive, but those lines are in different places for every reader. There are people who haven’t found the characters appealing in Best Served Cold, but there are also plenty of people for whom it’s their favourite book of mine. That’s one thing I take a kind of pride in, actually - I haven’t really observed a clear consensus on which is my best book or my worst. Hopefully that shows that I’m trying out a slightly different variation on the recipe each time around. - Your online presence (on your own website and on a number of SFF message boards) have contributed to your success and popularity. So much so that LAST ARGUMENT OF KINGS was an Amazon.co.uk Top 10 bestseller, while the book didn't do particularly well at brick-and-mortar bookstores. Has that changed at all? And if so, what was done by you and your publishers to give you more exposure in "non-online" venues? Didn’t do well at brick-and-mortar bookstores, how very dare you, sir, it took the publishing world by storm. Certainly the books did better with online retailers to begin with, but I think that’s probably just part of the natural development of an author, really, unless you’re one of the rare few who comes out with a big fanfare and a lot of marketing and expectation (which can have its own downsides). People who read a great deal of fantasy are maybe more likely to be online looking for new things. It’s not necessarily easy to reach those people but it is possible with a website and a bit of online word of mouth. Bricks and mortar bookstores, and supermarkets even more so, generally need to see a good track record before they get behind things, and it can take a while to build up a wider readership. With The Heroes it felt like a lot of things fell into place simultaneously – it got a lot of marketing and publicity support from my publisher, a lot of support from Amazon and Waterstones, who are the main brick and mortar store in the UK, and even a big push in Asda, a UK supermarket chain, which is nice to see because supermarkets don’t stock much fantasy and you can potentially sell a lot of books there to people you might otherwise never reach. Partly that was because of the time of year. Not a lot of big releases in January, so there are more resources to go around. - You did a damn good job with your short story "The Fool Jobs" for the SWORDS & DARK MAGIC anthology. Are there any other short fiction plans for you in the near future? It was damn good, wasn’t it? That’s very true. I wrote another short story linked to The Heroes which appeared in a Waterstones special edition in the UK, and I believe that’s going to be made more generally available in one format or another at some point. I’ve also written a short story involving one of the characters from my forthcoming book, which I hope will find its way into an anthology featuring a few other well-known (and better known) fantasy authors, but I won’t let the cat out of the bag. - How do you see heroism in epic fantasy? - I know that you have already responded to Leo Grin's "The Bankrupt Nihilism of Our Fallen Fantasists," so I don't want to re-open that can or worms. But considering what he, as well as other people who share his opinion, do you believe that there are some people out there who simply "don't get it?" Since The Blade Itself was published I’ve seen pretty much every imaginable response to my books, many of them entirely contradictory, and that tends to steadily undermine your notions about there being some absolute truth “to get”. There’ll always be a range of opinion (if you’re lucky enough to have any opinion expressed at all) and as a writer you have to find a way to accept that and weigh the value of the diverse reactions you see. The aim shouldn’t necessarily be to please everyone with everything you do. That isn’t really possible, or even desirable. The argument that western society is being dragged into the toilet through insidious attacks on the legacy of Tolkien by college-educated liberals with cynical fantasy as the weapon of choice? Honestly, that doesn’t seem to correspond to any of the observable facts of reality as I see them. The less hyperbolic and politically charged argument that there’s too much cynicism in fantasy and where’s the heroism and the wonder gone? That’s totally valid, obviously, and equally obviously a matter of opinion. For me, there are still a lot of long-established writers, and honestly a fair few newer writers, still shifting an awful lot of units of relatively traditional fantasy. I don’t mean that as any kind of criticism, incidentally. People should read (and write) what they enjoy. But for a long time optimistic, heroic, relatively predictable visions were in the great commercial ascendant in epic fantasy. I see what’s happening now as being a healthy correction, drawing in new readers to a genre that was perhaps a little stale. If nothing else, it encourages those who’d rather see more optimistic, heroic visions to up their game and find new and more exciting ways of expressing those ideas. I look forward to seeing that happen. Maybe I’ll even take part. I wouldn’t want to become predictable for withering cynicism any more than for cloying optimism. I think what’s important is to have strong, fresh, exciting voices in the genre, not that they be voices of one particular kind or another. - I have to admit that I’m really looking forward to your next novel. Please tell us everything you can about it at this time. I can’t help but imagine it as a Tarantino-inspired re-telling of The Good, The Bad and The Ugly. It’s a Tarantino Good, Bad, Ugly, it’s a Guillermo del Toro Lonesome Dove, it’s an Ingmar Bergman The Searchers. It’s a fantasy western, basically, in the same way that Best Served Cold was a fantasy gangster revenge story and The Heroes is a fantasy war story. Again set in the world of the First Law, again a sort of standalone featuring some familiar characters alongside some new faces, hopefully combining the edgy yet humorous approach to fantasy for which I am known and widely despised with some outside influences. No sixguns, alas, but a lot of other western motifs. And maybe a mechanical dragon. - Any tentative title and release date? - When you see generic blogger X apply the term gritty or subversive to your work, what is your reaction? - When Joe Abercrombie goes to the costume shop to get something to ‘look the part’, what does he get? Sidetracked and ends up in the pub. Or possibly the video game shop. WHEN WILL ABERCROMBIE ALLOW THE RETURN OF THE BLOODY F#@%ING NINE? I know it's a sacrosanct thing to treat an author like an monkey organ, but Logen is so amazing a character that it's nearly physically painful to be away from him this long. Love the books, Mr. Abercrombie. You keep writing them, please. I was glad to see him address the lack of sympathy for characters, especially in Best Served Cold. Since I had just blogged about it on Thursday, it almost felt like he was speaking directly to me. I disagree slightly that there isn't a backlash against Tolkienesque fantasy going on. At least on the writing/agenting/publishing web where so many of us wannabe writers spend a lot of time, I see so much disdain being shown for anyone daring to want to write Tolkienesque fantasy, not caring that there are still many of us out here who love it and wish for more. I haven't seen any actually get published since McKiernan's Silver Call duology. Best Served Cold is Abercrombie's best imo. I had much more trouble relating with most of the First Law characters than with Monza or Shivers. That said, my favourite Abercrombie character is still Logen Ninefingers. My favourite character from The Heroes is probably Wirrun of Bligh. He reminds me, for reasons I can't really put my finger on, of Minsc (but without Boo) from the Baldur's Gate games. Probably my favourite fantasy character in any medium ever. If people are looking for more 'classic' fantasy, I hear good things about Peter Orullian's The Unremembered. I also heared some bad things about it, but mostly from circles that seem to have problems with the Tolkien/Jordan/Brooks style fantasie. I'm glad to see that I'm not the only one for whom BEST SERVED COLD didn't hit the mark. HEROES was a nice return to form. I'm really hoping/thinking that he's saving Logen up for the second trilogy he's going to get around too after this next book. I cruised through the First Law trilogy faster than any other series i've read in the past ten years. I loved it. I was excited to get to Best Served Cold and The Heroes. I haven't read The Heroes yet, though I did buy it... but after reading Best Served Cold, I decided for a little Abercrombie break. BSC went way too far in the dark/cynical direction for me. I'm hoping The Heroes takes a few steps back from the line. Actually discovered Abercrombie through Best Served Cold, myself. Finished it quickly, and then immediately had to get the First Law Trilogy. Both are epic, and awesome, but I actually find that I liked BSC a little more precisely because it was so dark. The characters are ugly and unsympathetic, true, but that's exactly what made them seem so very HUMAN to me. This has continued to be the thing that defines Abercrombie's work for me: his characters are believable, since they are not stuck being archetypal symbols of good. McKiernan is the best writer of Tolkeinesque fantasy that I have ever run across, and I love his work for some of the same reasons that I love Abercombie: fantastic characterization. But I get different things from McKiernan: discussion of the nature of good and evil, right and wrong, and the follies of humanity (through the eys of the elves, mostly). Abercrombie also shows me the follies of humanity, but by letting me viscerally experience them. Very different, but there is room for both, and plenty more besides. I do agree with Tree Frog, that I really would like to see Logen make a comeback...He will probably be quite unhappy it, knowing Logen. I am not normally a big fantasy fan, but bought Best Served Cold on the reccomendation of a Waterstones drone and loved it (so much so that I ended up googling the author's name and commenting on a site like this). I then read the First Law trilogy and snapped up the Heroes as soon as it came out). As someone that is constantly tired at wading through the lake of bulls**t that seems to cover the modern world, I find the author's brand of Fantasy Noir refreshing. I particularly admire his skill with dialogue, and for that reason have wondered whether he has ever considered trying his hand at a screenplay. Mr. Abercrombie is now on the very short list of authors whose stuff I look out for whenever I'm in a book shop. Hope he keeps it up. Glockta needs a stand alone story.... im just saying HE was the best! agree. glockta all the way. I Find it odd so many people say Best Served Cold "missed the mark". I actally think its my favourite. Only slightly above the First Law Trilogy!! Logan Ninefingers is my favourite character by far.